This is a select list of events, trips and camps that the Outing Club offers from the University of Maine at Presque Isle. For more information on our events, please contact Amanda Baker, Assistant Director of Gentile Hall, at 768-9401. Thank you for your interest in our exciting and adventurous University Outing Club! As long as the weather holds out, the Outing Club journeys south in the early fall and late spring to either the beautiful coast of Maine – Acadia National Park, or Central Maine to Clifton, where we push our physical limits as we climb up vertical rock faces! Thanks to local Certifed PCIA Climbing Instructor, Lenny Cole, we are able to provide safe and energized guided rock climbing trips!! As an outing club, we have both hosted and attended exciting bouldering competitons around the state of Maine. If you are interested in bouldering or climbing, you don’t want to pass up these opportunities. The last couple of winters have treated us well in the mountains of Maine and New Hampshire. 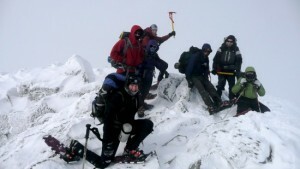 In March of 2008 we found ourselves battling the snow and ice on the Abol Trail on Mount Katahdin. This past February we touched the top of both Jefferson and Adams in the Presidental Range of the Whites in New Hampshire. We incorporate at least one winter mountaineering experience every winter. Camp out in our canvas wall tents and explore the outdoors. Learn fundamental camping skills and have fun hiking and enjoying all that Maine has to offer! Crawl around holes in the ground and have a great time doing it with OAPI’s annual caving trip! Never a dull moment as we shot our way down class V rapids on the West Branch of the Penobscot River in central Maine! This annual fall event is sure to get your adrenaline pumping! Look to sign up for this trip the first week of the fall semester.